Chocolate bars in ice cream form are becoming a common sight in supermarket freezer cabinets. And this year there are even more. 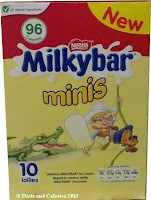 Among the latest onslaught of ice creams and lollies on the shelves are Milkybar minis. These are definitely for white chocolate lovers. 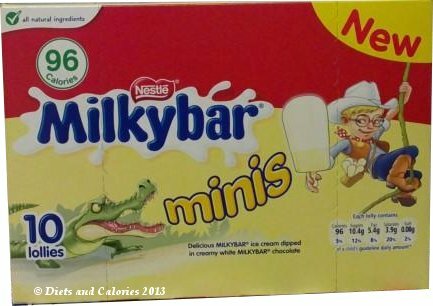 Like the bar, they're creamy, smooth and sweet and they're ideal as a sweet treat on a hot day. If you're watching the calories, you can enjoy a Milkybar mini for 96 calories. ‘White chocolate ice cream dipped in white chocolate’. 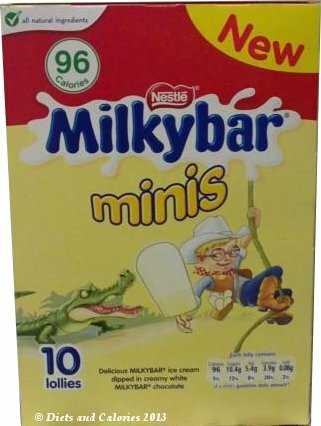 They’re available in boxes of 10 x 30ml mini ice creams and are sold in major supermarkets. 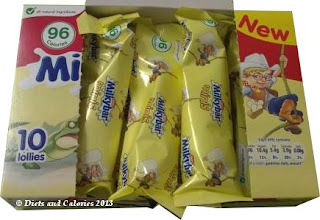 Nutrition information per mini lolly: 96 calories, 1.3g protein, 10.4g carbohydrate, 10.4g sugars, 5.4g fat, 3.9g saturates, 0.1g fibre, 0.08g salt. Suitable for vegetarians. At least they are all natural!